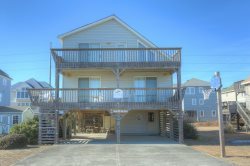 Welcome to the Sand Box, a 4-bedroom getaway for your next Outer Banks vacation. Situated at the end of a cul de sac, this ocean side vacation rental home provides plenty of privacy for you and your family. When you spend a week at the Sand Box, you will enjoy the brand-new decks and screened-in porch, which are the perfect places for sipping your morning coffee or drinking a glass of wine. Kick back and relax in the new deck furniture while you read a book or chat with loved ones. Need to stay connected during your escape to the barrier islands? The Sand Box offers free Wi-Fi for guests. If you're searching for recreation opportunities, you'll find you are only a short drive from the community tennis courts -which are located in Section D, E, or F for your enjoyment. Well-decorated bedrooms offer a serene place for sleeping and just enjoying your stay, and the beautiful tiled, walk-in shower on the top floor will make you feel as though you're living in the lap of luxury. Plus, brand-new plush carpet on the stairways and all-new flooring on the top level has been installed for the 2017 season. For your ultimate convenience, The Sand Box provides a beach wagon that will make carrying your chairs, toys, towels and beach gear a breeze when you head out for an afternoon spent in the surf or on the sand. The property is located adjacent to the new bike path that will take you to nearby shopping and dining establishments. The Sand Box is the perfect beach getaway. Book your stay today and let the countdown to your beach vacation begin! Top-Level: Kitchen Dining / Living Area with a Screen Porch Queen Bedroom and Full Bath.